Shyvanna (LoL) vs. Dragon Knight (Dota 2) - Who will win? As a cosplayer, that playes both Dota 2 and League of Legends, I stand between two camps and have sometimes problems, which character from which game to choose. League of Legends has 124 champions, Dota 2 has 110 champions: As a cosplayer you want to choose a character, that fits you well. Both games offer a wide spread of different characters to choose from, so it is a little better selection in LoL. I´ve made a little overview of Dota 2 and League of Legends characters on the end of this entry. I´ve divided heroes and champs into groups and if you look into groups non-human like and human-like, League of Legends has about 45 champions in both categories, so it´s much easiers to pick a character, that looks like a human and doesn´t need any prosthetics and other stuff, than in Dota 2, where we find only about 15 characters in human-like category and about 80 heroes in non human-like category. Look into the overview once more. There are two categories, that count characters, that need mounts or wings construction. 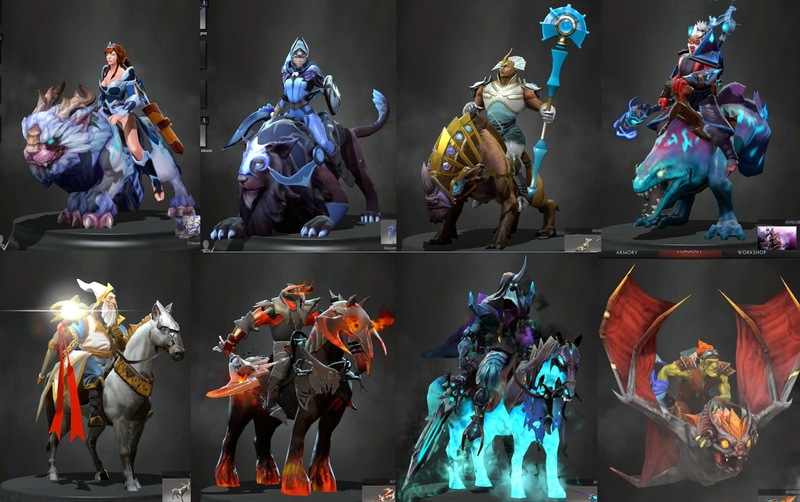 In Dota 2, there are much more characters with mounts and wings than in League of Legends. So it´s pretty hard to choose a character in Dota 2 if you´re afraid of making wing construction or don´t know how to make a mount. The mount is always a problem, even in League of Legends, but take a look on this LoL cosplay example on the pictures above. 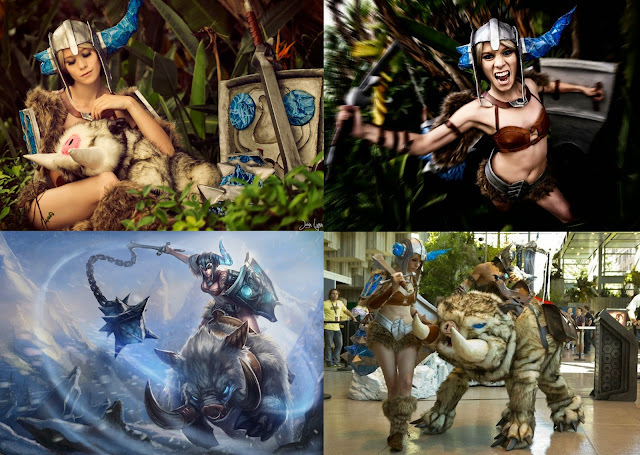 The pictures are a cosplay of Sejuani by Britthebadger. She´s really the first cosplayer I´ve seen on a real man made mount, that was in fact a big fur costume for a person. But if you don´t have money/friend/skill to make yourself a real mount, you can make a baby of your mount from a fur (like she did too), or go without a mount (that´s a pitty, but sometimes there´s no other chance). 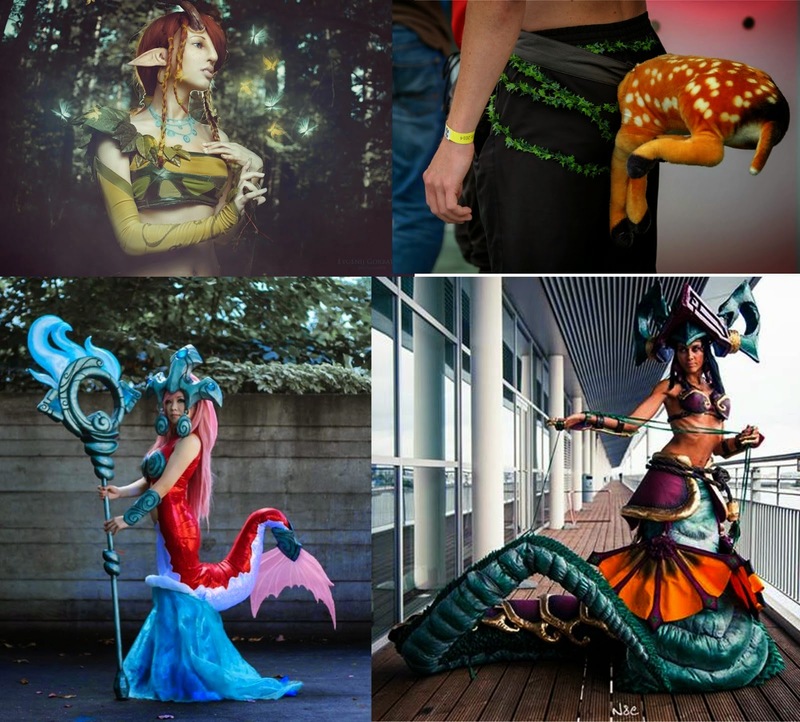 On the second picture, there are two Dota 2 cosplays, Luna by Desireeska and Keeper of the Light by Lumi. Luna has found a great spot to take picture of her: on a statue of a lion and Lumi took it to the next level: he made his cosplay complete by taking a real horse on a photoshoot. Second problem could be the non-human/half-human characters. It´s a real challenge to make a hero like Lifestealer with a lot of teeth all over his face, or a hero like enchantress with half her body human and half of her body deer, But take a look on these pictures, where you can see some examplest of solving this problem. First there is a cosplay of Enchantress by day4off, but the picture shows only her upper body and the cosplayer didn´t have to solve the problem with deer body. Next to this awesome cosplay, there is a real original deer body for Enchantress. Next examples are from League of Legends. Nami by Pizoobie solved her problem with her fish tail by designing original dress with bottom part looking like water and hiding her legs. Jadefang Cassiopeia by Lady Misterya made her prosthetic tail as a combinantion of her sewing and crafting skills. It´s half a dress and half a moving marionette. There´s a big difference in customizing your characters between both games. In Dota 2 you can choose from lots of different item sets and change your heroes hair, weapon, mount, dress, or even tattoos separately. The item sets are just bundles of items, that fit together. The items approved for use in game respect the nature of each hero and have to respect the color scheme of the hero. In most cases, they lack animations. You can preview your hero in game andy equip him in in-game armory. From the view of a cosplayer, the item sets represent an aspect of free will (you can pick from a lot of combinations and a lot of items), but even the item sets could be very beautiful, they are all approximatelly the same challenge, the same level of difficulty, so there´s no way both beginner cosplayer and a master cosplayer would both choose this as a cosplay plan. In League of Legends you can buy only skins for your champion, that change the whole outfit and appearance of your champion. 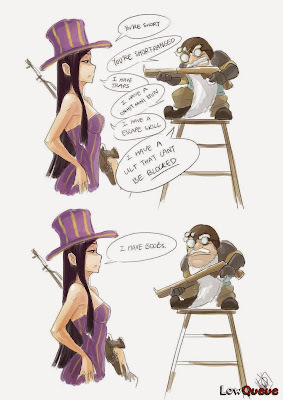 The skins don´t respect any codex of the character, so you can one champion dressed as a bunny, zombie, witch, football player, basketball player, pirate or a soldier. 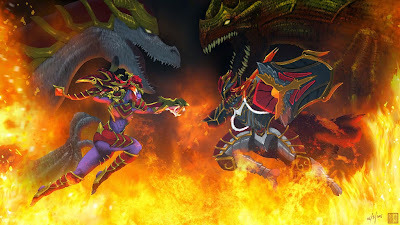 These interesting and funny skins attract more players into the game and into the cosplaying the characters. Furthermore the skins are differently complicated for a cosplayer to make. There are really complex skins, that are hard to make and are a challenge even for an experienced cosplayer and there are skins that are quite easy to make and are good for beginner cosplayers (Bilgewater Katarina vs. Red Card Katarina). One difficulty is with splasharts, because skins are only available to buy by viewing a splashart picture made by an artist. Sometimes, the splashart picture doesn´t 100% resemble the skin in game and that could cause some difficulties by cosplaying. I haven´t seen any similar propagation of Dota 2 in our country. On top of that is League of Legends much better in propagation of their champions. There are a lot of cinematics made by Riot and even thematic instrumentations for some heroes. Dota 2 has made some cinematics too, but they are not as good as League of Legends cinematics so far. There are actually more cinematics fromo League of Legends including cinematics made only for the songs dedicated to some champions (see beautifly animated Amumu song HERE). Mirana, Luna, , Chen, Disruptor, Keeper of the Light, Chaos Knight, Abaddon, Batrider (Centaur Warrunner, Gyrocopter, Enchantress, Bane, Leshrac, Outworld Devourer - somehow similar to mount). 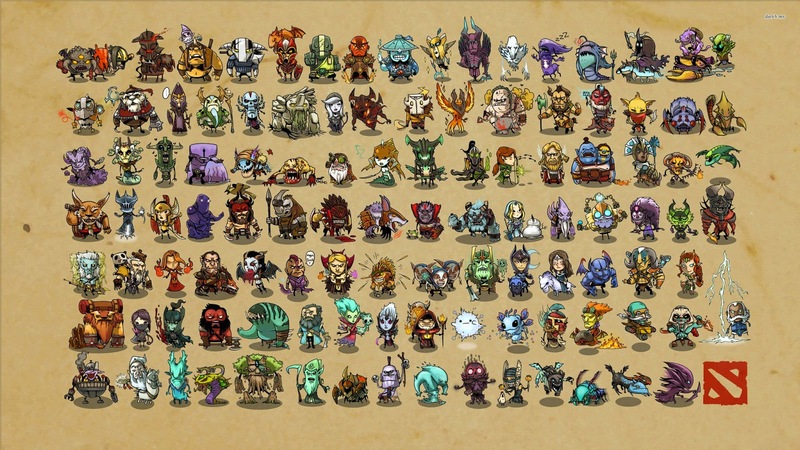 Earthshaker, Tiny, Brewmaster, Treant Protector, Centaur Warrunner, Bristleback, Tusk, Elder Titan, Earth Spirit, Phantom Lancer, Riki, Bounty Hunter, Ursa, Naga Siren, Troll Warlord, Ember Spirit, Nature´s Prophet, Enchantress, Jakiro, Ogre Magi, Huskar, Alchemist, Timbersaw, Shadow Shaman, Tinker, Disruptor, Techies, Sven, Huskar, Alchemist, Juggernaut, Vengeful Spirit, Templar Assassin, Strom Spirit, Oracle, Axe, Pudge, Slardar, Sandking, Tidehunter, Wraith king, Lifestealer, Nightstalker, Doom, Spirit Breaker, Chaos Knight, Undying, Magnus, Shadow Fiend, Razor, Venomancer, Faceless Void, Viper, Clinkz, Broodmother, Weaver, Spectre, Meepo, Nyx Assassin, Slark, Medusa, Bane, Lich, Lion, Witch Doctor, Enigma, Necrophos, Pugna, Dazzle, Leshrac, Dark Seer, Batrider, Ancient Apparition, Puck, Outworld Devourer, Winter Wyvern, Visage, Shadow Demon. Legion Commander, Vengeful Spirit, Skywrath Mage, Doom, Terrorblade, Queen of Pain, Jakiro, Visage, Puck, Winter Wyvern, Outworld Devourer, Viper, Phoenix (Venomancer, Tinker, Batrider, Phoenix). Kunkka, Beastmaster, Dragon Knight, Clockwerk, Omniknight, Legion Commander, Anti Mage, Crystal Maiden, Windranger, Zeus, Lina, Silencer, Rubick, Sniper, Lone Druid, Lycan, Bloodseeker, Warlock, Invoker, Gyrocopter. Death Prophet, Templar Assassin, Drow Ranger.